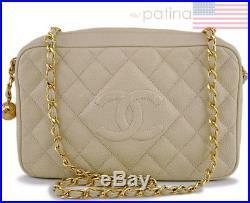 Chanel Vintage Light Beige Caviar Classic Quilted Camera Case Bag. If we have more than one of the same model, we will shoot each item individually and will never reuse photos. Details about this item: This Chanel Vintage Light Beige Caviar Classic Quilted Camera Case Bag is beyond classic. Perfect for day or night, this vintage classic is impossible to find in stores with the intricate piping, quilted Caviar calfskin material and the classic jeweled golden ball charm. A truly luxurious vintage item that is a head-turner for sure. A collectible, and a look that is making a comeback in boutiques. This item is in excellent, rare condition with very few signs of use. Corners are clean with no signs of rubbing or scuffing. Gold hardware is a deep, yellow gold hardware, gleaming and shiny. Note: Chanel no longer uses 24k gold to plate their golden hardware as they did with this model. Please see photos for details. Signature Chanel quilted Caviar calfskin in Light Beige - Interior lined in Light Beige lambskin - Piping detail - 18k Gold Plated woven chain strap - Zipper top closure and golden jeweled ball charm zipper pull dangling by woven chain - Interior features side pocket and side zipper pocket - Hologram sticker inside - Measures 9.5in. W (at base) x 5.75in. D, strap drop is 18 inches - Comes with Dust Bag, Authenticity Card. Every piece we list is manually inspected and pre-authenticated prior to listing. 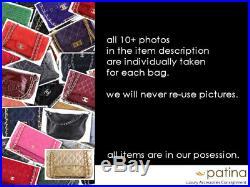 Photographs for each listing are unique to the bag for sale that the customer will receive. Even if it is the exact same model, we will never re-use photos. We started doing this to give our customers extra peace of mind, since each piece we sell is pre-owned. A signature is required for you to receive your package. 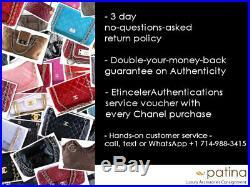 For pre-owned (not New) Chanel bags. The item must be the same condition in which it was received by you and our tag must still be on the bag. If there is no tag (which we secured and is tamper-resistant) on the bag, we will not accept the return. This tag is necessary for two reasons. To ensure that the item sent back to us is the exact same item you received. For brand new / New With Tag / New Chanel bags and. Most of our items are previously used, and the condition is described in each listing above the bulleted portion of the item's attributes description (last complete paragraph preceding bulleted list in each listing). We are selective - Patina Consignments is committed to carefully and professionally curating one of the most desirable collection of authentic pre-owned Chanel and Hermes handbags in the United States. We look forward to helping you find another home for your luxury items. The item "Chanel Vintage Light Beige Caviar Classic Quilted Camera Case Bag 62628" is in sale since Friday, February 16, 2018. This item is in the category "Clothing, Shoes & Accessories\Women's Handbags & Bags\Handbags & Purses". The seller is "*patina*" and is located in Irvine, California.